Interpersonal skills are also known as social skills. The process of using social skills is called socialization. We all learned socialization skills at an early age. Before we could even talk we were learning socialization skills from the caregivers around us. 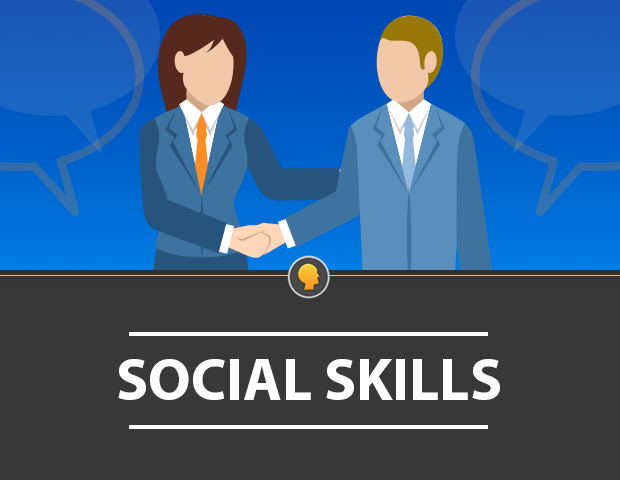 In the workplace, social skills are known as interpersonal skills. Both social skills and interpersonal skills refer to the same thing—interaction with others. In the workplace, you will work with many people every day. Strong interpersonal skills will enable you to talk to and work with all types of people, including managers, coworkers, and customers. Interpersonal skills do more than give you the ability to communicate with other people. Interpersonal skills also help you to develop relationships with people. Strong relationships with the people you work with will help you succeed in the workplace. Research shows that poor interpersonal skills are the number one reason why people don’t get along, don’t get promoted or, even worse, lose their jobs. You spend a lot of time with the people at your workplace. If you are a full-time employee, you can expect to spend 40 or more hours a week with your coworkers. You can begin to understand why it is so important to have good relationships with your coworkers and managers! Good relationships will help you get along well with people and help you to do your job better. Have a difficult coworker or manager? Always remain polite and professional towards that person. If you need to confront that person make sure you do it thoughtfully. You never know! A difficult coworker could become a friend over time. The ability to understand and relate to the feelings of others is called empathy. Having empathy will help you develop strong relationships with other people. When you have empathy, people feel that you understand them and how they feel. When people tell you about something important, it shows they feel comfortable around you. Do your best to put yourself in their shoes. Think about how you would want to be treated if you were in their position. What would you want someone to say to you? What would you hope someone would do for you? Cooperating, or working well with others, is an important part of interpersonal skills in the workplace. Even though each employee might have his or her own individual tasks and goals, the entire staff or team has the same goal. That goal is to help the company be successful. Without cooperation, the workplace can be an unpleasant place, and the company will not succeed. Before starting on a group project or collaborating, make sure each person understands what is expected of them. Ensure each person is able to share his or her ideas or thoughts. Encourage your group to be a safe space for sharing and collaborating. Having an overall positive attitude will affect many aspects of your work. A great attitude will help you cope with pressure and stress as well as help you be more flexible in your job. Always sharing a positive attitude will help you grow in your position and ultimately help you move forward in your career. When you show respect for others in the workplace, people will show respect for you. You can show respect for others by being polite and using your manners. Always remember to say please and thank you. When people are talking to you, listen to what they are saying and make eye contact to show that you are listening. Wait until other people have finished talking before you respond so that you don’t cause them to forget what they wanted to say. Interpersonal skills are not just about the things you say at work, they also include your actions, or the things you do. The way you act toward people at work will determine whether or not they feel comfortable around you. Start by always standing an appropriate distance away from the person with whom you are talking. A good rule of thumb is to stand an arm’s length away from the person. That way, other people can easily hear you but will not feel like you are in their personal space. Some people don’t like to be touched, so it is important that you respect people’s personal space. Besides a simple pat on the back or handshake, it is best not to touch people in the workplace. Keeping your hands to yourself will ensure that you don’t offend or upset others. Active listening means you are fully engaged while listening to someone talk. You’re completely focused on the person speaking. You are giving them eye contact, nodding, and occasionally asking clarifying questions to make sure you understand. Next time a coworker or manager is speaking to you. Put your phone, computer, or notebook down and fully engaged. You’ll be surprised how much better you understand what they’re telling you and how much better you’ll remember later. Art Janowiak III is the VP of Sales and Marketing at The Conover Company. He graduated from St. Norbert College and is a sales expert. He has experience speaking, training and putting together online courses for emotional intelligence and career assessments. He currently lives in Appleton, WI with his wife and three children. Great help, especially number 7. No problem, Kholekile! Active listening is something that can help eliminate a lot of miscommunication. Thanks for reading. Art… do you do in-house adult-based training covering the 7 skills for the professional workplace? Hi Fred – we don’t do many in-house trainings because they cost you (the customer) a lot of money. We do webinars and have products that cover this stuff though. I will email you so we can chat. Helpful tips. Interpersonal skills is absolutely essential for professionals. I am a fresher and going to give an interview for the first time.Tips you discuss in your article are great and helpful for every one. The articles on IE are very helpful in providing me with coping skills and promote understanding of of some behaviours that have the capacity to be destructive in the workplace. Yes, to succeed in a goal must come from a good personality.